AP ICET 2019 Schedule announced for Certificates verification and Web counselling/web option Entry: AP ICET-2019 Certificate Verification Dates for Web Counselling for APICET 2019 Admissions: The qualified candidates of A.P-ICET-2019 are informed to attend certificate verification in any one of the Help Line Centers (HLCs) as per the schedule given under. The list of Help Line centres, the distribution of Ranks for each Help Line Centre for Certificate Verification, See the Annexure-I for OC/BC/SC/Minority Category Candidates and Annexure-II for ST Category candidates and all other important information is placed on the Website: http://sche.ap.gov.in/ICET/ICET/ICET_HomePage.aspx and candidates are informed to visit this website before they go for Certificate Verification. Eligible Candidates of AP ICET-2019 are informed to exercise the options using their old password and Login ID No. for the leftover seats now available and consequential vacancies that may arise in the process of allotment if any, from Help Line Centre or Internet facility (Cafe/ Home) as per the schedule given below. The candidates who have not attended certificate verification during first Phase should get their certificates verified on ....08.2019 from anyone of the Help line center. However the special reservation category candidates (Anglo Indian/ Sports/ NCC/ CAP/ PH) who did not get their certificate verified earlier should get their certificate verified now at Govt. Polytechnic, near Benz circle, Vijayawada only on ....08.2019 only. And exercise options the same day and also on .....08.2019 till 6.00 PM as per the ranks mentioned below. The complete details can be obtained from the APECET website on the third day of July. 1. Candidates who have secured seats but not interested to join. 2. Who have not secured seat so far. 5. Who have reported/Not reported but cancelled their 1st Phase allotment. 6. Who have not attended for Certificate verification earlier should get their certificates verified on ......08.2019 from any Help Line Center and exercise options. 7. Who have reported through Self reporting System but not reported at College. 8. Who have reported through Self reporting System and reported at College. LAST Means: Including not qualified/ not appeared A.P-ICET Minority candidates who have already applied to Convener and given ranks based on Qualifying Examination Marks. 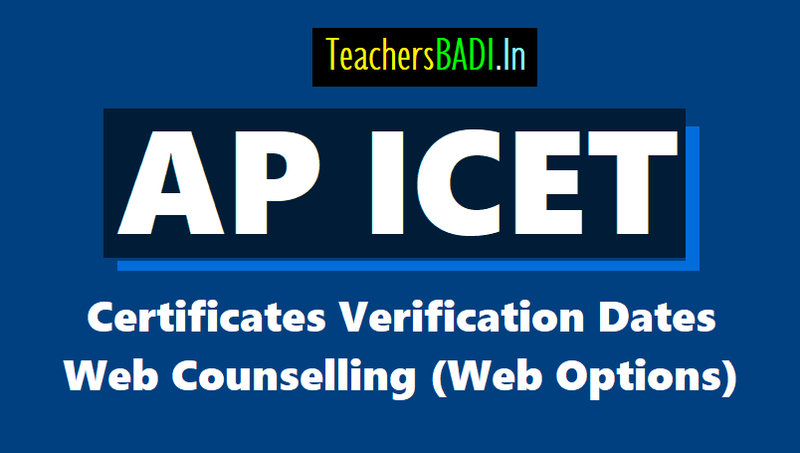 AP ICET Admission notification for Certification verification and Option exercising for web based counselling: The qualified and eligible candidates of AP-ICET-2019 are informed to attend certificate verification in any one of the Help Line Centers (HLCs) as per the schedule given under. The list of Help Line centres, the distribution of Ranks for each Help Line Centre for Certificate Verification, refer Annexure-I for OC/BC/SC/Minority Category Candidates and Annexure-II for ST Category candidates and all other important information is placed on the Website: https://apicet.nic.in and candidates are informed to visit the website before they go for Certificate Verification. 2. Processing fee can be paid by the candidate using credit card or debit card or through net banking from .....07.2019. Candidates who secured 50% (For OC) and 45% (SC/ST/BC) aggregate marks in Degree or its equivalent examination are only eligible for admission. - Aadhar card along with Two sets of Xerox copies. B. CENTRALISED CERTIFICATE VERIFICATION (for PH, CAP, NCC, Sports & Games and Anglo Indian): ONLY AT ANDHRA LOYOLA COLLEGE,NEAR RAMESH HOSPITAL(I T I ROAD), VIJAYAWADA. PH-Certificate issued by the District Medical Board. Candidates with 40% and above disability are only eligible. CAP- Certificate issued by Zilla Sainik Welfare Officer (In case of Ex-Service men) Identity card and Service Discharge book for verification. Candidates whose parents are domicile of Telangana & Andhra Pradesh are only eligible to be considered under “CAP” Category. NCC & Sports- To produce Original Certificates issued by competent authorities. Minorities: SSC ‘TC’ containing Minority Status or Certificate from the Head Master. Anglo- Indian: A Certificate issued by Competent Authority of their place of Residence. 1. Processing Fee: Rs. 1200/- (OC/BC), Rs. 600/-(SC/ST).see at web site. Are the verification dates right??? Is the above information correct?. I cannot find the same in any official website. How we get information about Verification centers?